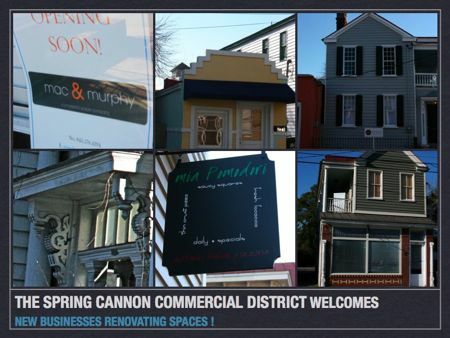 There are some new businesses working hard, renovating to open up in the Spring Cannon Commercial Corridor. I had a hand in finding some of them their new locations. Coming soon to 141 Spring St is Fuzzco design studio. Fuzzco has been amazing Charleston with their extremely inventive and unique style since 2005. They were previously located at 10 Storehouse Row in the Navy Yard at Noisette, but made the bold move last summer of purchasing a large home on Spring and putting it through a major renovation. The results are fantastic and while they do not yet have a sign up, rumor has it they are already hard at work in their newly renovated offices at 141 Spring. Also on Spring at number 162 is the innovative new salon Stela Blu, they are still working on renovation but plan to open in March, more on them will be forthcoming. Mac & Murphy a Charleston Paper Company is poised to open very soon at 74&1/2 Cannon. They report a unique line of stationary, cards, note pads and journals along with a meditative garden and a postage area so customers can purchase, write notes, and post correspondence all on location using their one of a kind paper products. On the food front, two new adorably petit restaurants are scheduled to open within the next month or so. On Rutledge, right next to the incomparable Cafe Lana is Mia Pomodori, a much anticipated Pizza restaurant in the tiny house formerly occupied by Dave’s Seafood Carryout. They have built a deck on which reportedly they will be serving up beer, wine and some very fresh and authentic italian cuisine. On the other side of the block on Coming is a tiny building that is being painted and renovated to house a sandwich shop, paper on the window hides the layout but I suspect a carry out situation, more to come on this as well.